Dunn, according to Suskind, was simply saying that her loyalty — and that of others — to the president prevented anyone from ever going legal with their issues….The quote was originally uttered in a long telephone conversation in April. Once he had a manuscript in hand, in the summer, Suskind called Dunn back and explained what he was prepared to publish. Dunn was the one who took issue with the preamble [this refers to the six words, I assume] — as it turns out, her husband was serving as White House counsel while she was communications director, and so she didn’t want to be making a comment about actionable conditions at the workplace given her husband’s role. So she petitioned Suskind to replace the preamble with the “looking back” treatment that’s now in print. In general, I don’t think there’s any excuse for truncating a quote, regardless of whether you think it changes the meaning or not. But this is different: if it was Dunn herself who asked Suskind to truncate the quote, then he’s blameless. Dunn herself apparently refuses to talk about this further, so we don’t have her side of the story. But for now, it looks to me like Suskind is in the clear. He was actually helping out Dunn, who then had buyer’s remorse when the quote appeared. 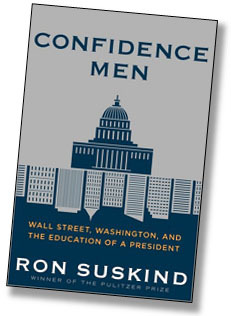 Sympathetic to the women’s point of view, the official directed Suskind to speak with Dunn, who had left the White House for a consulting gig in town. That’s the context that helps explain why Dunn was so forthcoming to Suskind: She would lend an authoritative and on-the-record voice to a lot of stuff he’d picked up. The author hastens to note that neither Dunn nor the anonymous White House official who made the referral was committing an act of insubordination. These officials were pleased that the president had taken steps to right the gender imbalance. “They felt that the president did step in here, and it was a management-teaching moment for him,” says Suskind. So Dunn and others did feel the White House was a pretty hostile workplace for women, but they were also pleased that Obama addressed the problem once they brought it up with him. Unless Dunn decides to comment further, that’s where things stand.